The ways runners can use internal dialogue are varied. All over this blog, I have shown a variety of ways illustrating how to use your internal dialogue to enhance performance, however, here is an overview of ways I recommend employing your internal dialogue to advance your running performance. As I have written about before now on this blog with mindfulness and thought spotting exercises, we need to have an awareness of our internal dialogue in order to make any decision about whether it needs updating or changing (Meichenbaum, 1977). So using your internal dialogue to tell yourself what you have noticed is a good way to help be more aware. I realise that could sound confusing – using internal dialogue to be more aware of internal dialogue. However, if you think of it also as using your conscious, purposeful internal dialogue to notice automatic thoughts that seem to happen all by themselves, then that might help. As well as those kinds of exercises, keeping a simple log of thoughts and putting a tick in a column of ‘negative’ and ‘positive’ thoughts will show which dominates and I’ll be showing how to use thought forms later on when wI refer to thought stopping. Runners can use internal dialogue when trying to correct their running technique, form or habits picked up throughout life. For those fortunate enough to be coached or advised on technique, or just those that are self-correcting their running posture, progressive use of internal dialogue can help to purposefully “override” old automatic habits if they occur. I recall attending a chi running workshop a number of years ago and my stance in those days was a muscular, powerful one whereby I lifted my quads up from the thigh to run. At the workshop I was encouraged to raise my lower leg towards my backside by squeezing from the hamstrings. It was so much more efficient and effective yet I would keep drifting back to the old way of running. My use of my internal dialogue started with actual instructions telling myself to lift the leg differently and moved to a single word advising me to “lift” which I knew what it meant through repetition. Once you build a new habitual style or technique, you can stop with such use of internal dialogue. As an aside here, I am not a technical running coach with qualifications in biomechanics and orthotics and the likes that are required for helping individuals with technique. As far as I can see also, the evidence base with regards to the Chi Running (Dreyer, 2008) I have mentioned here is not substantive or impressive. I found personal gain to be had with this process during my own exploration throughout the years, but I am not promoting its use universally. It was just my way of illustrating this point. although I have written previously, examining ways of getting the correct levels of arousal and focus as well as writing some more on this subject in coming months, I thought this warranted a brief mention. For today’s purposes, know that runners can effectively use internal dialogue to appropriately and beneficially focus attention during training or races. This can be done with mental imagery or by using words inside the mind that stimulate and hold focus. Likewise, both imagery and trigger words can be used to boost arousal and stimulate energy levels and well as relax the body and calm the mind when needed. As I mentioned previously, a runner’s internal dialogue can directly affect belief and confidence in a detrimental or progressive way. If the internal dialogue is dominated or heavily punctuated with negative expectations and too much doubt, this will adversely influence the confidence of the runner. Runners can all be prone to outside influence, but all are responsible and in control of their own internal dialogue. There are rare occasions that negative internal dialogue can motivate, but it is incredibly rare for dominant negativity to have any beneficial use. It is wise for internal dialogue to be accurate and grounded in realism. Offering up an honest critique to ourselves of our performance can have use. In fact, using internal dialogue directly after a training run or an event or race to reflect upon the performance is seen as beneficial and is encouraged. However, simply blinding ourselves with unrealistic praise and shrouding ourselves in sickly sweet positivism could create illusions that impair performance. For example, a study by Kirschenbaum, O’Connor, and Owens (1999) showed that golfers who were unrealisitcally optimistic with inaccurate positivity about their skill level, tended to make poor decisions and shot selection. With the awareness of our thoughts in place and developing an ongoing attitude and internal environment of awareness, the runners internal dialogue can then be adapted, changed and updated if necessary. We have a wide number of ways of doing that, most of which we’ll focus on in more depth in later chapters. Stopping certain thoughts in their tracks can help limit and prevent unwanted internal dialogue (Meyers & Schleser, 1980). Thought stopping shows the runner how to interrupt and stop unwanted thoughts as they happen or prior to them happening. Sometimes this might involve using the word “stop” or imagining a stop sign flashing in the imagination or it could involve a number of ways of getting the internal dialogue to be quiet or turned down. With frequent and persistent use, the unwanted thoughts tend to lessen. One very practical way to do this and incorporate some of our previous themes, is to start using a thought form. There are many, many types of thought forms from within and outside of the field of cognitive behavioural therapy that I use within my therapeutic work to help clients update their cognitions and internal dialogue. Here with regards to our running, a very simple form can be used to heighten awareness of our internal dialogue and also help restructure internal dialogue. You simply divide a page into 3 columns. You keep the form with you throughout your days, and keep vigilant and aware of your thoughts. If and when a problematic thought is said within your internal dialogue, you write it down unabridged and unedited in the first column. You get to see it exactly as it is and the thought becomes exposed and vulnerable. It is also moved out of your head by doing this, which ceases the way the brain makes it worse and amplified by letting it rattle around in your head. In the second column, you then write down how you think that thought can detrimentally affect you and your running performance. You are refuting the thought here and applying some rationale and intelligent reasoning, showing yourself it is of little value to continue with such thoughts. Then in the third column you write up a replacement, progressive, beneficial thought that you say to yourself with meaning, purpose and volition. You then repeat it inside of your mind a few times for it to start restructuring your thoughts. For example, a runner may catch himself thinking “I can’t be bothered to run today.” The runner writes that down exactly as it was said, in the first column. Then in the second column, he writes that “by thinking this, I am talking myself out of training which could negatively effect the goal I want to achieve of running that half marathon in June.” Then, having given it some thought, he writes in the third column “I really want to get out and enjoy a run today, I know how good I’ll feel afterwards.” He then repeats that with a sense of conviction and belief a few times to really get it registered. The negative thought in the internal dialogue has been 1. Spotted. 2. Disputed. 3. Restructured. Some forms will encourage you to measure your level of belief and assess the ownership you have of your thoughts and you may wish to explore and investigate other more comprehensive thought forms to monitor your internal dialogue should you wish. However, this method here is going to be useful, effective and simple. They should help you get started on that path for sure. With this type of approach, we aim to allow positive thoughts to dominate and prevail in our internal dialogue. However, we don’t really just want one set of thoughts to be shouting over another set of thoughts. A favourite process of mine that I use in my therapy rooms very often has it roots in cognitive behavioural therapy and is referred to in the field of hypnotherapy as the cognitive mood induction. The process encourages you to accept the negative thoughts if they happen, not resist them or fight them and let them simply lead into more positive and progressive thoughts. This process is explained in depth later in this book. Whilst I love the previously mentioned process, sometimes just changing negative internal dialogue into positive may be rendered impotent if we do not believe in the positive statements and in fact still attach belief to the negative internal dialogue (Bell, 1983). We need more than to simply be nice and civil to ourselves. As you saw within the thought form, we learned to understand the negative impact of the problematic thought. This reasoning and understanding of the unwanted thought helps the runner to let go of and cease having belief in the unwanted thought and serves to counter the unwanted thought. Bell (1983) recommends that when athletes believe in negative internal dialogue, they benefit more by building a case against that belief or negative thought and giving himself proof of it being non-useful. This advances the change. We have the belief updating process already at our disposal from an earlier blog entry. We also now have the understanding of doing that with or without a thought form; there should be no excuse for applying some rationale against negative thoughts and really aiding your internal dialogue. 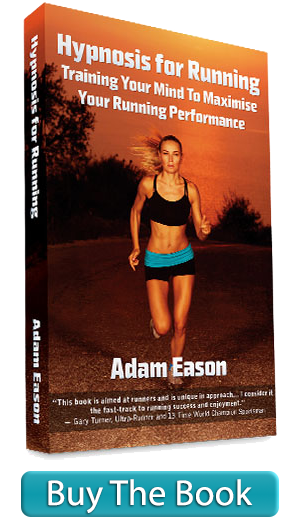 The runner benefits from intelligent reasoning as well as offering up a new thought. Those in the NLP (neuro linguistic programming) refer to this as reframing. Some runners can be a bit hard on themselves and others can be very limiting in the way they perceive themselves and their ability. Gauron (1984) recommended the technique of reframing for changing an athlete’s frame of reference, or view, of the world. Often, athletes can change negative self-statements to positive by changing their perspective. You saw how we did the same with the previous fast breathing runner, who reframed to be aware of himself as excited with this important race, not just nervous in a negative fashion. Likewise, using reframing to keep perspective is used by lots of professional sports people, though I tend to find it disappointing when footballers who have scored a hat-trick in a match say “well, the three points was most important and we have to now focus on next weeks important game against United” when I want them to say “yes! I scored a hat trick, I’m going to call my Mum and celebrate at the pub with my mates tonight!” I do understand the importance of not getting carried away. Runners will want to use the crest of a wave gained in a good race and let it propel the ongoing training or goal setting for the next event instead of getting complacent. There is a wide array of mental imagery techniques here on this blog which require the orchestration of the internal dialogue. I hope this has begun to get your juices flowing with regards to how to use your internal dialogue and cognitions. In coming months, there’ll be many more direct and detailed applications for it. Bell, K. F., (1983). Championship thinking: The athlete’s guide to winning performance in all sports. Englewood Cliffs, NJ: Prentice-Hall. Dreyer, D. (2008) Chi Running. Pocket Books. Gauron, E. F. (1984). Mental training for peak performance. Lansing, NY: Sport Science Associates. Gould, D., Guinan, D., Greenleaf, C., Medbery, R., & Pederson, K. (1999). Factors affecting Olympic performance of athletes and coaches from more and less successful teams. The Sport Psychologist, 13, 371-394. Kirschenbaum, D. S., O’Connor, E. A., & Owens, D. (1999). Positive illusions in golf: Empirical and conceptual analyses. Journal of Applied Sport Psychology, 11, 1-27. Meichenbaum, D. (1977). Cognitive-behaviour modification. New York: Plenum Press. Meyers, A. W., & Shleser, R. A. (1980). A cognitive-behavioral intervention for improving basketball performance. Journal of Sports Psychology, 3, 69-73.